Not all projects can be cut on standard size trimmers. For these applications, Dahle offers large format line of Guillotines. These industrial sized cutters are designed to cut large amounts of paper with your safety in mind. Each cutter has built in features that will make your cutting task a safe and pleasurable experience. Dahle Large Format Guillotines are manufactured in Germany and can be found in art departments, custom frame shops, and print & copy centers. 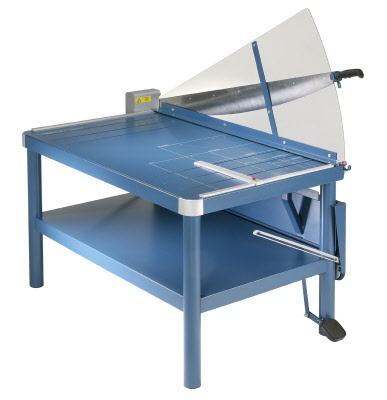 Dahle’s Professional Series Large Format Guillotines are table mounted and made of a durable laminated wood base. These cutters feature a metal safety guard, manual clamp, and a lockable T-square that can be mounted on either end of the cutting surface. This series is available in 30", 36" and 42" cutting lengths and make easy cutting of press sheets, mat board, and up to 40 sheets of paper at a time. Dahle’s Premium Series Large Format Guillotine offers such safety features as a lockable blade and acrylic safety shield to eliminate the chance of unauthorized use and injury. These cutters provide cutting lengths of 32" and 43" and includes an integrated metal stand. 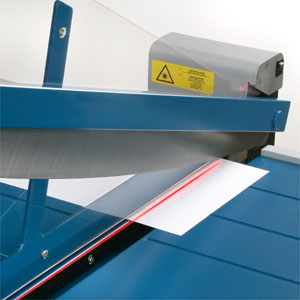 A self sharpening ground steel blade makes easy work of cutting of press sheets, mat board, and up to 40 sheets of paper at a time. The adjustable hand crank and lockable T-square ensure you receive the precision you need each and every time. Available models are: Dahle 569, 580, and 585 (797, Laser Guide Optional). The Dahle 569 is an ultra-wide, large format guillotine paper cutter with added safety and measuring features. 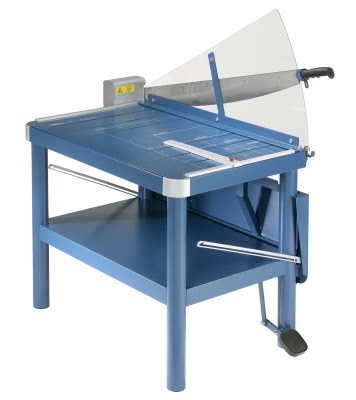 Designed for use on a table top or work bench, the large 27 1/2" cutting size accommodates small and large jobs alike. Designed for professional and commercial applications such as drafting and architecture studios, print and copy centers, and graphics design houses - this model withstands heavy duty use from day to day. 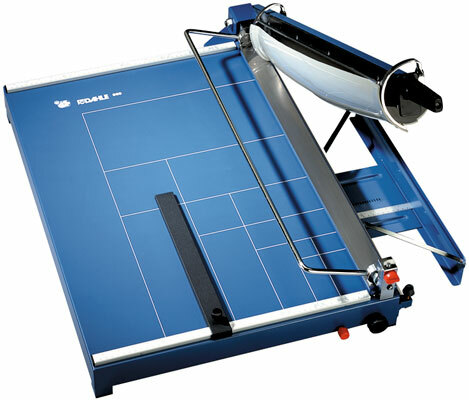 Dahle 580 Premium Large Format Guillotine Paper Trimmers are industrial cutters. Designed for heavy work loads, and constructed to with-stand commercial applications and environments. This commercial grade cutter is designed for larger applications with precision and accuracy in mind. 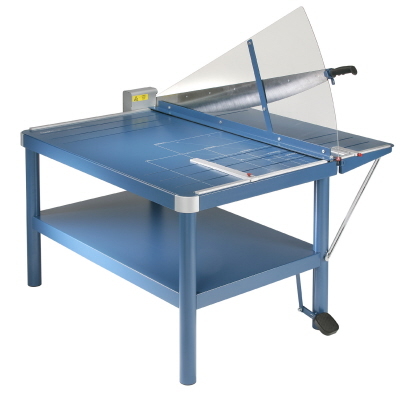 The table format, provide an extending fold up cut off tray extension which can be folded down when not used. Dahle 585 Premium Large Format Guillotine is one of the largest area trimmers available on the market in its class. 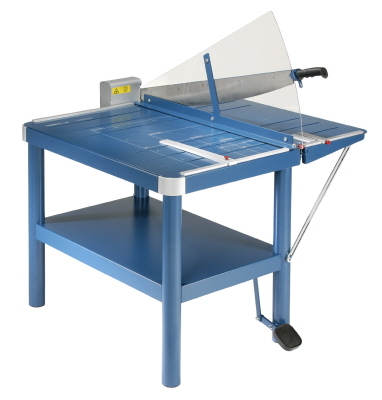 With an ultra-sized 43" cutting area, it can accommodate most jobs in the print trade and can be used for other commercial / industrial applications. One of the neat features of this unit is the optional laser guide which is used to indicate the exact trim line on material. This maximized accuracy and eliminates waste due to improper measuring by the user.